We Can Do Any Custom Job! • Need 500 CDRs or DVD-Rs in 24 hours? • Quality Service with Quick Turn Around! We can duplicate content to USB stick or even SD/SDHC card with custom packaging. With a full range of media sizes, our USB/SD service is a fast and reliable service. For those with legacy systems to support, we also offer diskette duplication. Need a product catalog or software on CD? A USB distribution or your Corporate show reel on DVD? Formats has solutions with it's flexible, custom, corporate services. All of your ink and media supplies right here... Ink, Ribbons, Media and Packaging. All online, purchase via PayPal for quick delivery. Formats Unlimited, Inc. is a service company which specializes in CD Duplication Services, SD & USB Flash Drive Duplication services, DVD Replication Services, Audio disc ripping, Data Archive Migration, DVD Manufacturing, Custom Printing, Packaging and Supplies. Since 1979, Formats Unlimited has serviced the corporate and music industry with cost saving solutions for the duplication, replication and printing of CD, DVD and Blu-ray discs. Formats saw a need for more sophisticated duplication equipment to meet their growing demands for formatted and duplicated disks. This led Formats to design and develop a line of duplication and printing equipment. The in-house software engineering team at Formats Unlimited, Inc. developed the intellectual property for all DVD copier systems previously known as MediaFORM and will continue the development of MF Digital branded products. As the Demand for DVD and CD production has become more refined, and targets a Quick-Turn around market, Formats responded by incorporating an in-house design team for artwork design and digital printing to compliment the disc manufacturing and duplication operation. Conversion of audio CD’s (ripping) to a digital format and stored on removable Hard drives for home theaters is a rapidly growing business. 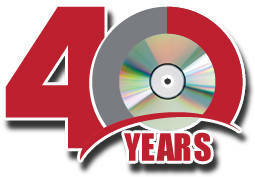 We have the capacity to rip thousands of CD audio or DVD video. Our Data services, also known as Data migration, are also offered at our Deer Park, NY location. Client’s digital assets are stored in a secure area. Hi Tom, I rec’d your ad. Just want to thank you for the great job you all did for my sons (3DBros.) during the Christmas holiday. Your company went the extra mile to get the job back to us expeditiously. I expect that you will hear from us in the near future regarding another project and we look forward to working with you again! Have a happy and safe festive season and ill be in contact first thing Jan 2014 of a big DVD job I need done. Thank you again so much for your help on the VS project. They LOVED the look and quality of the disks. Huge success. Thank you so much you are awesome. You have done one hell of a job. Every order is on time or early. I have never missed any of my days to our folks in the field or on the manufacture floor. You’re a pleasure to work with and when I retire I am going to miss you and all of Formats the most. If every vendor was like you, what a great place this would be. Thanks again. Formats Unlimited provides ADI with excellent service. I’ve been working with Formats for the past four years and find the service to be efficient, speedy and extremely organized. Quality Service.